Must use the “Student e-portfolio” theme on a publicly available site. 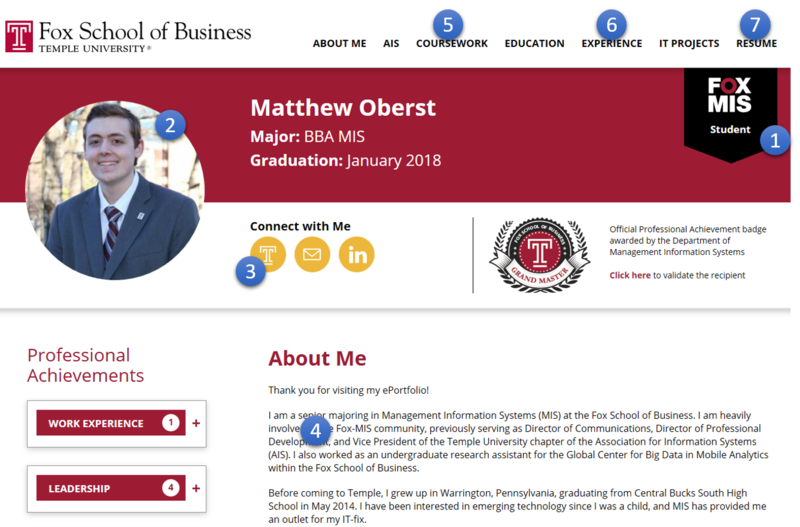 Appropriate site title based on your name, business professional picture on the top left of the home page, all sample pages and posts removed, and e-portfolio linked to your profile. Update the following Community platform profile fields: major, affiliation, employment status, employment job title, job seeking interest, type of job interest, relevant job experience, skills and interests, job interest, and graduation date. About me (home) page: Briefly describe your personal and professional background. Coursework page: List selected courses taken followed by what you learned from each course in one or two sentences. Optional: Include a picture or downloadable file of an interesting project. Experience page: List each professional position including internships and part-time jobs. Describe your role in each position. Optional: Include a company picture. Interests page: Describe professional and personal interests. Include a picture or other visual element that highlights the interest. Resume: Downloadable MIS specific resume in PDF format. (Note: Consider removing the home address from the public resume). Professionally formatted with no typos. Complete ALL the above seven requirements. There is no partial credit. If one of the requirements above is missing or incomplete, the e-portfolio will be rejected. Log-in to Community, on the top left hover on My Sites, select the new e-portfolio, and click on Dashboard. Click Add New near the top. Select Basic e-portfolio. Review the Community platform profile fields and update as needed. Scroll to the bottom of the screen. Make sure the URL of the new e-portfolio is selected. Once submitted, the e-portfolio is reviewed. The review process takes 2-5 business days. You will receive approval or rejection notification on email. To check status online, navigate to the Dashboard, hover on Professional Achievement, click Manage Points. Approved e-portfolios will automatically receive 50 PRO points. Review the feedback. Navigate to Manage Points and click on Comments under Basic e-portfolio. Navigate to Manage Points and click Resubmit under Basic e-portfolio to restart the process. About Page enhanced: One or two paragraphs that describe who you are to a prospective employer including skills, background, and goals. Coursework page enhanced: One or two paragraphs that describe coursework AND how they relate to your career/job interest. Experience page enhanced: One or two paragraphs that describe what you did in an internship or part-time job and how that has enhanced your career/job preparation and skills. Add a post to three different earned PRO point activities (e.g., meeting with industry executives, chairing an AIS committee, participating in a challenge or competition, participating in research). Describe in one or two paragraphs the activity, why it is interesting to an MIS professional, and what you learned. Presentation: Display an interesting presentation that showcases your skills and experiences (e.g., class project, capstone project, research project). Display the presentation on slideshare, YouTube, or some other open online platform. Embed the presentation within your site. Follow the procedure above, except select Advanced e-portfolio in step 3.